Set in the early 2000s, Australian geologist, Sandy (Toni Colette), takes Japanese investor Hiromitsu (Gotaro Tsunashima) on a road trip exploring the resource rich region of the Western Australian Pilbara. The Area C BHP Mine is located on the Great Northern Highway, 120 kilometres north-west of Newman. Many locations in the Newman region are featured in Japanese Story. Prominent among them is the BHP iron mine. The Capricorn Roadhouse is located at 10 Great Northern Highway, sixteen kilometres south of Newman. Sandy and Hiromitsu eat at the Capricorn Roadhouse after getting their car "un-bogged". The scene at Capricorn Roadhouse were shot on-site. The exterior was also used for the petrol station scene. Hiromitsu swims at Dampier Beach. Dampier was designed and constructed in 1965 by Hamersley Iron as a port-town for the transportation of iron ore. By 1968, however, the population had outgrown the town's capacity and Karratha was established twenty kilometres to the south-east. Dampier Beach has an ocean pool, barbecue facilities, and a boating and sailing club. The Burrup Peninsula and the Dampier Archipelago, fourteen kilometres north-east of Dampier, contains the largest collection of rock art in the world. The petroglyphs are estimated to number between 500,000 and one million, with numerous works depicting the now extinct Thylacine (Tasmanian Tiger). It is a significant site for Aboriginal country groups of the Pilbara and beyond. The Ngayarda language groups call the location Murujuga, meaning "hip bone sticking out". Hearson's Cove is twelve kilometres north-east of Dampier in the Pilbara region of Western Australia. Sandy and Hiromitsu sit on red rocks near Hearson's Cove on their drive into the Pilbara. Hearson's Cove is located in the Burrup Peninsula between Dampier and Karratha. The sheltered cove is a popular tourist attraction, with swimming and picnics enjoyed by people all year round. Kalgan's Pool is located off of the Great Northern Highway, fifty kilometres north-east of Newman. A permit is required to drive the Highway, which can be obtained from Newman Visitor Centre. Hiromitsu dives into the water at Kalgan's Pool. 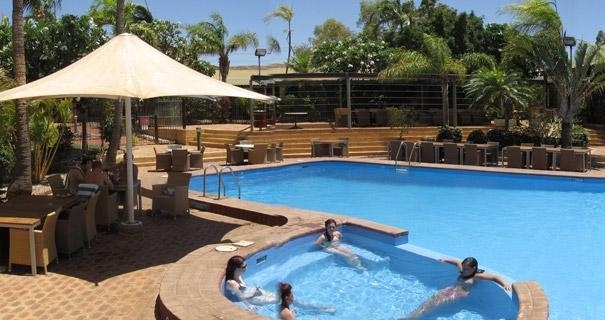 The Karratha International Hotel is located at Hillview Road, Karratha WA 6714. Sandy and Hiromitsu are staying at the Karratha hotel when they get together as a couple. Built in 1983, the Karratha International Hotel is located fifteen kilometres from Karratha Airport. Karratha International Hotel is the shooting location for the scene in which Sandy and Hiromitsu first get together. Marble Bar Road is located in Strelley, Western Australia, seven kilometres east of Port Hedland. Sandy and Hiromitsu get bogged down on Marble Bar Road. Mount Herbert Lookout is located in the northern end of Millstream Chichester National Park. The Millstream Chichester National Park is 200,000 hectares composed largely of spinifex hills, escarpments and tree-lined watercourses, in addition to the contrasting Millstream wetlands. The area is home to the Yinjibarndi Aboriginal peoples. The Millstream Homestead, which now serves as the Visitor Centre, was built in 1920. The Mount Herbert Lookout was the shooting locations for the lovers' panorama. Sandy and Hiromitsu first meet at Newman Airport. Perth International Airport was the shooting location for Newman Airport, located north of Perth.